YouTube clips. Texting. Twitter. Facebook status updates. The prevalence of short-attention-span media -- easily scanned or consumed -- has led to much hand-wringing over how students will develop that lifelong love of reading perceived to be so critical to lifelong learning. One answer (in addition to “it’s not as bad as you think,” as a recent Pew Research Center study might be summarized) may be in adapting the function to the form. Which is to say to put real, and sometimes classic, children’s books on the latest digital devices via apps and the web. That’s the tack several tech-oriented companies are taking with both fiction and non-fiction. And while the customer for each effort differs -- ranging from parents to teachers to librarians -- the emphasis is remarkably similar: instilling the love of reading and books early, even if there isn’t a physical book. LIVING BOOKS. Your first reaction may be that “Living Books” sounds familiar. And it should. A startup, Wanderful, is bringing back titles in the much-loved series that software company Broderbund originally produced two decades ago, at the dawn of the CD-ROM age. No longer restricted to physical discs or desktop computers underpowered for multimedia, the updated titles are returning as $5 iPad iOS apps (and eligible for Apple’s Volume Purchase Program for Education), with plans to add Android versions after the first of the year. These newest Living Books are being driven by leaders of the original team, including former Broderbund CTO Mickey W. Mantle (now CEO) and Living Books creator Mark Schlichting. For Young Readers: Print or Digital? educator-focused Classroom Activities Guide is available for $2.99 as an in-app purchase, tying each storybook to reading, arts, math, social studies and other subjects with alignment to Common Core State Standards. Wanderful’s Bill Hensley plans to have a free “sampler” app before the holidays (with a sample page of each title) and a second Arthur title, Arthur’s Birthday, is slated for January. READING RAINBOW. Earlier this year at the SXSWedu education technology conference, keynote speaker LeVar Burton (known, depending on one’s generation, as Kunta Kinte of Roots, Geordi La Forge of Star Trek: The Next Generation or the host of PBS’ long-running Reading Rainbow) announced to wild educator applause the return of Reading Rainbow as an iPad app. Burton’s RRKidz venture subsequently launched the app in June with 150 books, now up to 175 titles, sporting voice-overs, “light animations” and activities. Designed for kids ages 3-9, the iPad app is free and includes one book; others are part of a $10/month subscription (or $30 for six months). A companion website gives parents updates on the amount of time kids spend reading and recommends new stories based on their interests. Publishers involved include Little, Brown, Holiday House and Peachtree Publishers. RRKIdz says popular titles, so far, include A Child’s Calendar by John Updike and the I See I Learn series by Stuart J. Murphy. Android? Expect it in the first quarter of 2013. But those are books by the piece. What about books delivered by the digital pallet to school libraries and entire buildings? MYON READER. 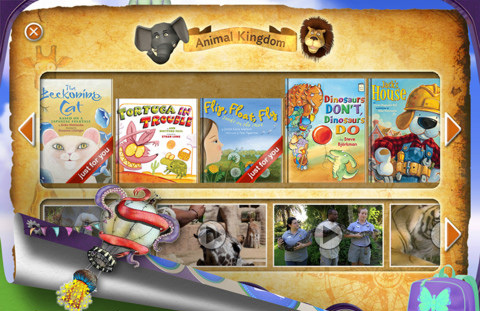 Capstone Digital has put more than 3,000 digital book titles on its web- and iPad- friendly myOn Reader enhanced eBook platform and expects to reach 4,000 by the end of the year. Each book is tied to Lexile measures for reading difficulty and ability level and has an embedded assessment. Most feature narration (for reading aloud), highlighting, a dictionary and other scaffolds which can be turned on or off as needed. And in an era driven by recommendation engines, myOn suggests more reading based on student interests. Books come from more than two dozen publishers such as Hachette, DK, Highlights and Capstone itself, ranging in reading level from early childhood to high school. Because of the education customer focus, myOn Reader has an annual school subscription model. Capstone estimates more than 4.25 million books have been read since it launched in January 2011. BRAIN HIVE. A different, pay-as-you go approach comes from Brain Hive. It’s a free web-based platform that works with Mac and Windows computers, tablets with browsers and through a dedicated iPad app. Brain Hive has more than 3,000 basic -- and non-interactive -- non-fiction and fiction eBooks for which school libraries pay $1 per student checkout. Books in the collection do offer bookmarking and note-taking capabilities. Familiar books include those in the Boxcar Children series, Franklin’s Thanksgiving by Paulette Bourgeois and others from major publishers such as Random House. While the names may resonate, questions were raised when this was shown at June’s ISTE conference about what happens when checkouts exceed a school library budget. The answer? Titles become “temporarily unavailable,” just as they might if a physical library ran out of copies. So does this mean many of today’s young children will never heft a physical tome? Unlikely. But they will come to understand that a book is more than its container, whether it’s paper or plastic. Frank Catalano is a consultant, author and veteran analyst of digital education and consumer technologies. He tweets @FrankCatalano, consults as Intrinsic Strategy, and writes a column for GeekWire. Full disclosure: he advised Capstone Digital on its plans for myON Reader in late 2010, but will never disclose his Lexile measure.